Today i am going to introduce a new brand DeBelle which is an Indian brand by AGS Incorporation . AGS is a cosmetic company which uses natural ingredients to prepare its products . Currently they have introduced only few products in skin care category . 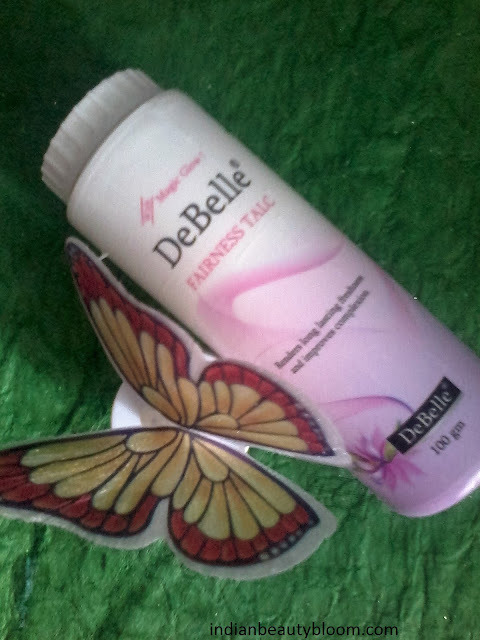 The first product from this brand which i have tried is DeBelle Fairness Talc. 1. Contains turmeric oil which helps to improve complexion . 2.Contains menthol which has cooling effect . 3.Product packaging is good and travel friendly , can be easily carried in bag or a purse . 4. Economical price , much less then talc from other brands . 5. Its Shelf life is 3 years , which is too good . 6.Has a nice fragrance which stays for long . 7.Easily available on online stores like Amazon.in , Flipkart.com . The product claims to render long lasting freshness and improve complexion . I am using this talc past few days and i really liked it , its good . It absorbs oil from face and gives a clean and matte look.